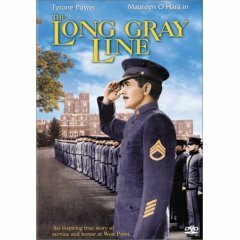 Based on the true story of Marty Maher, a humble Irish immigrant who rose through the ranks to become one of West Point's most beloved instructors, THE LONG GRAY LINE is a rousing tribute to a remarkable man and his way of life. Director John Ford and star Tyrone Power, themselves the sons of Irish immigrants, bring an extra dimension of fidelity and fervor to this inspiring biography. Newly arrived in America, Maher's first job was as a waiter at West Point. Clumsy and boisterous, he quickly broke so much of the military academy's china that he was forced to join the army to repay his debts.But once enlisted, the rough-and-ready Dubliner served his adopted nation with rare dedication, establishing himself as an inspirational coach at West Point. Spanning 50 years and two world wars, thefilm shows Maher at his best, molding and motivating the young men who would become America's heroes and presidents. Filmed on location with a stellar supporting cast (including Ford favorites Maureen O'Hara, Ward Bond and Harry Carey, Jr.), THE LONG GRAY LINE is a stirring reminder of Marty Maher's proud place in history. Summary The Thin Gray Line: The Best All Around!!! Comment: Very rarely in my life have I come across a movie that makes me cry. All you would have to do is watch the last 10 minutes of this movie to understand what I'm saying. However, you should see the entire movie - what perfection. It has comedy, drama, and great acting on all parts. Tyrone Power (my favorite actor) gives a grade A performance. Never will you find him as loveable, or as dignified than as Martin Maher, Jr. I find it hard to believe that John Ford (the director) originally wanted John Wayne for this movie. Not to nock Wayne, but Power can convey sensitivity better. As a side note, John Wayne's son Patrick appears in the movie. Maureen O'Hara, lovely as ever, gets back to her Irish roots in this film, and it makes for a point-perfect characterisation from the Queen of Technicolor. It isn't any wonder John Ford loved her as an actress. She's one of the best. The movie spans 50 years at West Point Military Academy, and the life of Martin Maher and the people's lives he touched. It is a great American story. Definitely, worth every bit of the two hours and seventeen minute running time. I love this movie, and if you read this you really should be watching the movie. Seriously, it made me cry!!! Comment: The movie overall is really a great story; the quality of the DVD is what really is what I find as poor quality. It's almost as though some one copied it using a video camera recorder. I already own a copy of the VHS tape and it is a far better version of the film. The actors are classics. I can only say good things about Maureen O'Hara and Tyrone Powers. Ward Bond also. There were others who were in supporting roles who deserve mention; still the story is one that really what is s classic piece of Americana that deserves remembering. Comment: Tyrone Power plays Irish immigrant Marty Maher, who joins the Army in 1902 and spends the next fifty years working at West Point. There he takes a part in the formation of America's future military leaders, including Dwight D. Eisenhower (played here as a young man by Harry Carey, Jr.). Maureen O'Hara plays his wife, and the great Donald Crisp his father. Ward Bond has a great role as Maher's mentor, Captain Keeler. This is a mawkishly shameless patriotic celebration of America, the military, the Irish, and Irish America. The last scene where Maher is reviewing the troops is a bit over the top. But if you're a Ford fan, you won't mind it, because you know that even at his most sentimental, he was ten times better than most directors! Comment: "Dulce et decorum est pro patria mori" -- "Proper and sweet it is to die for the Fatherland." These words from Vergil's "Aeneid" apply in spades to "The Long Grey Line." Beneath the film's overt message of patriotism, honour and glory lies one constant, recurring theme: It's a good, grand and glorious thing for young men to be so filled with dreams of militaristic "glory and honour" that they are ready to die for "The Reich." And it's a good, grand and glorious thing as well for the loved ones they leave behind in mourning. Am I being a touch judgemental? Darn right. So why did I give it four stars? First, any film with Tyrone Power, Maureen O'Hara, Ward Bond and the score of other fine actors (and an actress or two) is already worth at least three stars in my book. Secondly, the film is so over-the-top in its melodramatic depiction of "fantasy patriotism" that I wonder whether its creators didn't mean to suggest the folly of militaristic utopianism through the expedient use of a near lethal overdose of hyper-pious hands-over-hearts whenever Old Glory passes by, the ultra-dramatic portrayals that "my tragic loss is really my strength and glory," and the continuous flag-waving, death-worshipping and militaristic sentimentalising that saturates this film from start to finish. On the one hand, the war-sentimentalisers who have always sent and who continue to send young men to early graves for the sake of political and/or corporate interests will undoubtedly see this film in one light. One that appears to validate their own far-from-honourable interests and agendas. On the other, those who despise the fantasy of militaristic glory may well see a brilliant portrayal of the waste of young lives, a waste that brings the hero of the film to sanctimoniously mark the deaths of his former youthful cadets with a black ribbon in the appropriate yearbook. In either case, the message will be in the eye -- and prompted by the true nature of the heart and soul -- of the viewer. Whatever the case, I recommend that any viewer of this classic film follow up with a sobering shot of "Taps." And that in viewing that rather different presentation of military school cadets special attention be paid to the professional soldier who accuses his own honour-enraptured cadet son of being "in love with death." Summary The Thin Gray Line: Super movie no matter who you like Comment: Pay no attention to Pine Hurst reviewer. I like Jane Fonda and I like this movie. Everyone in my family is a Jane Fonda fan (including my father who was 20years in the Marines), and we all like the film. It's story telling at it's best. One of Tyrone Power's best performances and Maureen O'Hara is simply radiant. It made me want to know more about Martin Maher and his Mary. See this, and you won't be disappointed. John Ford pours on the sentiment like syrup in The Long Gray Line, a tribute to the traditions of West Point. Tyrone Power ages 50 years to play real-life West Point legend Martin Maher, the scrappy Irish immigrant who rises from "another Mick waiter" to hot-tempered cadet to one of the best-loved instructors of the institution. Power is at his best as the charming rogue with a thick brogue, who ages into a feisty, gray-haired foster father to the cadets he and his fiery Irish wife (Maureen O'Hara) adopt over the years, among them Harry Carey Jr. (as young Dwight D. Eisenhower). Ford claims he didn't care for CinemaScope, but you wouldn't know it from the handsome, lush images that fill the frame. It lolls along at a lazy 140 minutes, balancing the respectful tributes with boisterous humor and boyish pranks but always centered by the generous heart of Maher.